Oda was born in 1881. She was the daughter of Amos Hall and Mary Hale. She passed away in 1980. 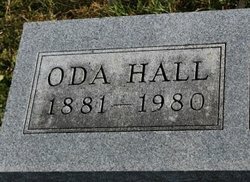 When Oda Hall was born on October 31, 1881, in Appanoose, Iowa, her father, Amos, was 40, and her mother, Mary, was 26. She had four sisters. She never married and took care of her father Amos until his death. Oda lived out the remainder of her life in her sister, Mabel's, home. She died in September 1980 in Centerville, Iowa, at the age of 98, and was buried there. Oda is 44 degrees from Graham Chapman, 29 degrees from Janet Wild and 19 degrees from Henry VIII of England on our single family tree. Login to find your connection.